Hillary Clinton’s fake southern accent is back and it’s worse than ever. 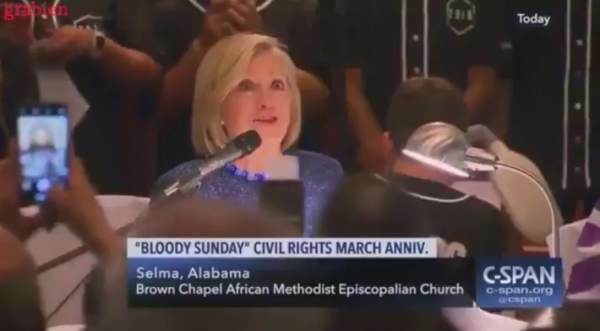 On Sunday twice-failed presidential hopeful Hillary Clinton spoke at a historic black church in Selma, Alabama for an anniversary event of the 1965 “Bloody Sunday” march from Selma to Montgomery. “Reverend Green, when those bones get up, and when that spirit is breathed into them, and they start climbing out of that valley, the first place they go is to register to vote!” Hillary said with her fake southern accent. Hillary Clinton has no shame — she always invokes a fake southern accent when talking to crowds in the deep south and the media never calls her out on her blatant pandering.